In today’s culture, muscle is frequently regarded as a characteristic of one’s appearance. However, if you describe muscle using the technical term “lean body mass”, the idea of toned bodies tends to exit the picture. Lean body mass (LBM) is often mentioned as a measure of weight gain or loss in scientific studies. For instance, weight loss trials commonly note the total amount of weight lost and the percentage of body fat and LBM loss. Naturally, in overweight individuals, it’s preferable to lose a significant percentage of excess body fat. At the same time, the goal is to preserve as much lean body mass as possible. The preservation of LBM becomes even more important as we age. Even in the absence of intended weight loss, older adults tend to lose muscle and strength as a “normal” part of the aging process. In some instances, age-related muscle and strength loss is even more pronounced and is classified as sarcopenia. This is of great importance because seniors diagnosed with sarcopenia are at greater risk of falls, fractures and a general decline in overall health and independence. In younger adults, building and maintaining muscle isn’t very complicated. A basic combination of a nutritious, protein-rich diet, resistance training and adequate sleep is usually enough. Unfortunately, the same strategy isn’t sufficient to turn the muscle wasting tide found in sarcopenic seniors. To be clear, a high protein diet (> 1 gram of protein per kilogram), aerobic and resistance exercise and ensuring adequate Vitamin D levels are advisable for those diagnosed with sarcopenia. But, in general, this approach doesn’t yield entirely satisfactory results. The addition of β-Hydroxy-β-Methylbutyrate (HMB) may well be a missing piece to the puzzle that has yet been fully integrated into conventional sarcopenic treatment plans. HMB may sound like an unnatural chemical produced in some remote pharmaceutical lab. In reality, the human body produces HMB from a common amino acid (leucine) which is found in everyday foods, including chicken, eggs and fish. But, the catch is that you’d have to eat way too much protein, about 600 grams/day, in order to provide enough leucine for your body to manufacture a therapeutic amount of HMB. The typical dosage of supplemental HMB is 3 grams daily. There are a number of reasons why I strongly endorse the use of HMB to attenuate age-related muscle loss. For starters, two recent reviews have validated its safety in both older and younger adults. And, there’s plenty of research to base that on since HMB has been scientifically studied in humans for about 20 years. Another unique characteristic of HMB is that it supports improvements in muscle and strength whether it’s accompanied by exercise or not. This is why studies in bedridden and critically ill, hospitalized patients have noted positive trends in lean body mass and protein synthesis. There is even some research showing a benefit to HMB supplementation in those with other muscle-wasting conditions, such as advanced cancer and HIV. This is very promising indeed. In closing, I want to mention that some of the HMB trials have utilized the supplement in conjunction with certain amino acids (arginine, glutamine and lysine). Having said that, studies that have examined the effects of HMB when used alone, reveal that additional amino acids aren’t necessary for treatment success. Lastly, one of papers I link to below, “Vitamin D Status Affects Strength Gains in Older Adults Supplemented with a Combination of β-Hydroxy-β-Methylbutyrate …”, reports that maintaining an optimal Vitamin D concentration (≥30 ng 25OH-vitD(3)/mL) enhances the efficacy of HMB in relation to strength gains. All the more reason to incorporate HMB as part of a comprehensive program which includes periodic Vitamin D testing. Geriatr Gerontol Int. 2015 Feb 5. To determine the long-term effects of interventions carried out for the improvement of muscle mass, strength, walking ability and fall rate, 4 years after the completion of the intervention. Out of 304 elderly sarcopenic women aged over 75 years, 155 participated in an intervention and 149 were excluded from the intervention. Those excluded were considered as non-participants and included in the analysis. Follow-up data were available for 259 women (135 intervention participants; 124 non-participants). Muscle mass was determined by bioelectrical impedance analysis. Physical fitness measurements and interview surveys were carried out at baseline and at 4-year follow up. Compared with the non-participants, women in the intervention group had significantly smaller reductions in measures of muscle mass, strength and walking speed from baseline to follow up. The absolute mean difference between the two groups was 3.7% (95% confidence interval -6.5 to -0.8; P = 0.012) for leg muscle mass, 10.7% (-21.0 to -0.3; P = 0.011) for knee extension strength and 8.4% (-16.0 to -0.9; P = 0.029) for usual walking speed. Instrumental activities of daily living disability significantly increased in both participants and non-participants in 4 years. The fall rate of the previous 1 year in intervention participants was 18.5% in 2008 and 23.0% in 2012 (χ2 = 2.122, P = 0.145), and 17.7% in 2008 and 29.0% in 2012 among non-participants (χ2 = 15.415, P < 0.001). Participation in an intervention could prevent significant declines in lower extremity muscle mass, strength and mobility, even in the long-term, and might be beneficial in suppressing otherwise significant rises in fall rates. J Gerontol A Biol Sci Med Sci. 2015 Feb 2. Day-to-Day Changes in Muscle Protein Synthesis in Recovery From Resistance, Aerobic, and High-Intensity Interval Exercise in Older Men. Resistance exercise (RE) and aerobic exercise are recommended for older adults for fitness and strength. High-intensity interval exercise (HIIT) is an understudied but potent potential alternative to aerobic exercise. This study aimed to determine how each mode of exercise affected the integrated day-to-day response of muscle protein synthesis. Sedentary men (n = 22; 67±4 years; body mass index: 27.0±2.6 kg m- 2 [mean ± SEM]) were randomly assigned to perform RE, aerobic exercise, or HIIT. Participants consumed a stable isotope tracer (D2O) for 9 days. Daily saliva samples were taken to measure tracer incorporation in body water. Muscle biopsies were obtained on Days 5-8 of D2O consumption to measure tracer incorporation into muscle at rest, 24 hours, and 48 hours following each exercise bout: RE (3 × 10 repetitions: leg extensor and press, 95% 10RM), HIIT (10 × 1 minute, 95% maximal heart rate [HRmax]), or aerobic exercise (30 minutes, 55%-60% HRmax). Myofibrillar protein fractional synthetic rate was elevated, relative to rest, at 24 and 48 hours following RE and HIIT. The increase in myofibrillar fractional synthetic rate was greater following RE versus HIIT at both time points. HIIT was the only mode of exercise to increase sarcoplasmic protein fractional synthetic rate 24-hour postexercise (2.30±0.34% d- 1 vs 1.83±0.21% d- 1). This study shows that in older men, changes in muscle protein synthesis in response to certain exercises are long lasting and that HIIT significantly increases myofibrillar and sarcoplasmic fractional synthetic rate in this population. Update: A client informed me that that best price on HMB appears to be a product by Excel Nutritional. I contacted the company to verify that they were, in fact, using the only source of patented HMB. They were forthcoming and stated that they are (using the sole, patented source of HMB). Also, I asked them to send me a certificate of analysis (C of A) to prove that the finished product (the encapsulated HMB) actually meets label claim i.e. contains the amount of HMB listed on the label. They did so. The recent C of A they sent me reports that the label claim is accurate for that particular lot. I’d still like to see independent testing on the product by ConsumerLab or some similar entity. I plan to contact ConsumerLab to see if they’re willing to initiate such as test. I’ll report back if any independent testing takes place. Am J Clin Nutr. 2015 May 20. pii: ajcn105833. BACKGROUND: Age-associated declines in muscle mass and function are major risk factors for an impaired ability to carry out activities of daily living, falls, prolonged recovery time after hospitalization, and mortality in older adults. New strategies that can slow the age-related loss of muscle mass and function are needed to help older adults maintain adequate performance status to reduce these risks and maintain independence. OBJECTIVE: We evaluated the efficacy of fish oil-derived n-3 (ω-3) PUFA therapy to slow the age-associated loss of muscle mass and function. DESIGN: Sixty healthy 60-85-y-old men and women were randomly assigned to receive n-3 PUFA (n = 40) or corn oil (n = 20) therapy for 6 mo. Thigh muscle volume, handgrip strength, one-repetition maximum (1-RM) lower- and upper-body strength, and average power during isokinetic leg exercises were evaluated before and after treatment. RESULTS: Forty-four subjects completed the study [29 subjects (73%) in the n-3 PUFA group; 15 subjects (75%) in the control group]. Compared with the control group, 6 mo of n-3 PUFA therapy increased thigh muscle volume (3.6%; 95% CI: 0.2%, 7.0%), handgrip strength (2.3 kg; 95% CI: 0.8, 3.7 kg), 1-RM muscle strength (4.0%; 95% CI: 0.8%, 7.3%) (all P < 0.05), and tended to increase average isokinetic power (5.6%; 95% CI: -0.6%, 11.7%; P = 0.075). CONCLUSION: Fish oil-derived n-3 PUFA therapy slows the normal decline in muscle mass and function in older adults and should be considered a therapeutic approach for preventing sarcopenia and maintaining physical independence in older adults. Eur J Clin Nutr. 2015 Jun 17. Double-blind, placebo-controlled pilot trial of L-Leucine-enriched amino-acid mixtures on body composition and physical performance in men and women aged 65-75 years. BACKGROUND/OBJECTIVES: Adequate protein intake is essential to retaining muscle and maintaining physical function, especially in the elderly, and L-Leucine has received attention as an essential amino acid (EAA) that enhances protein retention. The study’s aim was to compare the efficacy of EAA mixtures on lean tissue mass (LTM) and functional performance (FP) in a healthy elderly population. SUBJECTS/METHODS: Thirty-six subjects (65-75 years) volunteered to receive capsules with EAAs (Groups A and B containing 20% and 40% L-Leucine, respectively) or placebo (lactose containing 0% L-Leucine, Group C) for 12 weeks. The daily amount ranged from 11 to 21 g (0.21 g/ kg/day) and was taken in two equal dosages alongside food, morning and evening. Main outcomes measured before and after intervention were LTM and FP (30-s arm-curl test; 30-s chair-stand test (30-CST); 6-min walk test (6-WT); and handgrip strength). Secondary outcomes included dietary intakes and physical activity. RESULTS: Twenty-five subjects (11 male and 14 female) completed the study (Group A, n=8; Group B, n=8; Group C, n=9). Gains associated with medium effect sizes were noted in LTM (Group B, 1.1 ±1.1%, P=0.003) and FP (Group A in 30-CST (11.0±11.5%, P=0.02) and 6-WT (8.8±10.0%, P=0.02); Group B in 6-WT (5.8±6.6%, P=0.03) and a trend in 30-CST (13.2±16.0, P=0.06)). Significant differences between groups were not observed in secondary outcomes. CONCLUSIONS: Twice-daily supplementation of EAAs containing 20% or 40% L-Leucine improved aspects of functional status and at the higher level improved LTM. Further work to establish change in a larger sample and palatable supplemental format is now required. Scand J Med Sci Sports. 2015 Jul 1. doi: 10.1111/sms.12506. Vitamin C and E supplementation blunts increases in total lean body mass in elderly men after strength training. The aim of this study was to investigate the effects of vitamin C and E supplementation on changes in muscle mass (lean mass and muscle thickness) and strength during 12 weeks of strength training in elderly men. Thirty-four elderly males (60-81 years) were randomized to either an antioxidant group (500 mg of vitamin C and 117.5 mg vitamin E before and after training) or a placebo group following the same strength training program (three sessions per week). Body composition was assessed with dual-energy X-ray absorptiometry and muscle thickness by ultrasound imaging. Muscle strength was measured as one-repetition maximum (1RM). Total lean mass increased by 3.9% (95% confidence intervals: 3.0, 5.2) and 1.4% (0, 5.4) in the placebo and antioxidant groups, respectively, revealing larger gains in the placebo group (P = 0.04). Similarly, the thickness of m. rectus femoris increased more in the placebo group [16.2% (12.8, 24.1)] than in the antioxidant group [10.9% (9.8, 13.5); P = 0.01]. Increases of lean mass in trunk and arms, and muscle thickness of elbow flexors, did not differ significantly between groups. With no group differences, 1RM improved in the range of 15-21% (P < 0.001). In conclusion, high-dosage vitamin C and E supplementation blunted certain muscular adaptations to strength training in elderly men. J Am Med Dir Assoc. 2015 Jul 10. pii: S1525-8610(15)00388-6. BACKGROUND: Age-related losses of muscle mass, strength, and function (sarcopenia) pose significant threats to physical performance, independence, and quality of life. Nutritional supplementation could positively influence aspects of sarcopenia and thereby prevent mobility disability. OBJECTIVE: To test the hypothesis that a specific oral nutritional supplement can result in improvements in measures of sarcopenia. DESIGN: A multicenter, randomized, controlled, double-blind, 2 parallel-group trial among 380 sarcopenic primarily independent-living older adults with Short Physical Performance Battery (SPPB; 0-12) scores between 4 and 9, and a low skeletal muscle mass index. The active group (n = 184) received a vitamin D and leucine-enriched whey protein nutritional supplement to consume twice daily for 13 weeks. The control group (n = 196) received an iso-caloric control product to consume twice daily for 13 weeks. Primary outcomes of handgrip strength and SPPB score, and secondary outcomes of chair-stand test, gait speed, balance score, and appendicular muscle mass (by DXA) were measured at baseline, week 7, and week 13 of the intervention. RESULTS: Handgrip strength and SPPB improved in both groups without significant between-group differences. The active group improved more in the chair-stand test compared with the control group, between-group effect (95% confidence interval): -1.01 seconds (-1.77 to -0.19), P = .018. The active group gained more appendicular muscle mass than the control group, between-group effect: 0.17 kg (0.004-0.338), P = .045. CONCLUSIONS: This 13-week intervention of a vitamin D and leucine-enriched whey protein oral nutritional supplement resulted in improvements in muscle mass and lower-extremity function among sarcopenic older adults. This study shows proof-of-principle that specific nutritional supplementation alone might benefit geriatric patients, especially relevant for those who are unable to exercise. These results warrant further investigations into the role of a specific nutritional supplement as part of a multimodal approach to prevent adverse outcomes among older adults at risk for disability. J Bone Miner Res. 2015 Aug 19. Dietary Magnesium Is Positively Associated with Skeletal Muscle Power and Indices of Muscle Mass and May Attenuate the Association Between Circulating C-Reactive Protein and Muscle Mass in Women. Age-related loss of skeletal muscle mass and strength are risk factors for sarcopenia, osteoporosis, falls, fractures, frailty and mortality. Dietary magnesium (Mg) could play a role in prevention of age-related loss of skeletal muscle mass, power and strength directly through physiological mechanisms or indirectly through an impact on chronic low-grade inflammation, itself a risk factor for loss of skeletal muscle mass and strength. In a cross-sectional study of 2570 women aged 18-79 years we examined associations between intakes of Mg, estimated using an FFQ, DXA-derived measures of muscle mass (fat free mass as a percentage of body weight (FFM%), fat free mass index (FFMI, kg/m2 )), leg explosive power (LEP) and grip-strength (n = 949 only). We also examined associations between circulating hs-CRP (C-reactive protein) and muscle mass and LEP, and explored the potential attenuation of these relationships by Mg. We compared our findings with those of age and protein intake. Endpoints were calculated by quintile of Mg and adjusted for relevant confounders. Significant positive associations were found between a higher Mg and indices of skeletal muscle mass and LEP, and also with hs-CRP, after adjustment for covariates. Contrasting extreme quintiles of Mg intake showed differences of 2.6% for FFM% (P trend <0.001), 0.4 kg/m2 for FFMI (P trend = 0.005), and 19.6 watts/kg for LEP (P trend < 0.001). Compared to protein these positive associations were 7 times greater for FFM% and 2.5 times greater for LEP. We also found that higher hs-CRP was negatively associated with skeletal muscle mass and, in statistical modelling, that a higher dietary Mg attenuated this negative relationship by 6.5%, with greater attenuation in women aged over 50 years. No association was found between Mg and grip strength. Our results suggest that dietary magnesium may aid conservation of age-related loss of skeletal muscle mass and power in women of all ages. Eur J Clin Nutr. 2015 Aug 26. doi: 10.1038/ejcn.2015.137. Effects of 6-month supplementation with β-hydroxy-β-methylbutyrate, glutamine and arginine on vascular endothelial function of older adults. BACKGROUND/OBJECTIVES: Vascular endothelial function declines with advancing age, due in part to increased oxidative stress and inflammation, and this age-related vascular dysfunction has been identified as an independent risk factor for cardiovascular diseases. This double-blind, placebo-controlled trial investigated the effects of a dietary supplement containing β-hydroxy-β-methylbutyrate (HMB), glutamine and arginine on endothelial-dependent vasodilation of older adults. SUBJECTS/METHODS: A total of 31 community-dwelling men and women aged 65-87 years were randomly assigned to two groups. The treatment group received two doses of the supplement daily (totaling 3 g HMB, 14 g glutamine and 14 g arginine) for 6 months, whereas the control group received an isocaloric placebo. At baseline and week 24, vascular endothelial function was measured by flow-mediated dilation of the brachial artery, and fasting blood samples were obtained to measure high-sensitivity C-reactive protein (hsCRP) and tumor necrosis factor-α (TNF-α). RESULTS: Paired sample t-tests revealed a 27% increase in flow-mediated dilation among the treatment group (P=0.003), whereas no change was observed in the placebo group (P=0.651). Repeated-measures analysis of variance verified a significant time by group interaction (P=0.038). Although no significant changes were observed for hsCRP or TNF-α, a trend was observed for increasing hsCRP among the placebo group only (P=0.059). CONCLUSIONS: These results suggest that dietary supplementation of HMB, glutamine and arginine may favorably affect vascular endothelial function in older adults. Additional studies are needed to elucidate whether reduced inflammation or other mechanisms may underlie the benefits of supplementation. J Clin Endocrinol Metab. 2015 Aug 26:jc20152352. Impact of the macronutrient composition of a nutritional supplement on muscle protein synthesis rates in older men: a randomized, double blind, controlled trial. CONTEXT: An impaired muscle protein synthetic response to feeding likely contributes to muscle loss with aging. There are few data available on the effect of the macronutrient composition of clinical supplements on the postprandial muscle protein synthetic response in older subjects. OBJECTIVE: To determine the impact of the macronutrient composition of a nutritional supplement on the postprandial muscle protein synthetic response in older men. METHODS: A total of 45 non-sarcopenic older men (age: 69±1 y; BMI: 25.7±0.3 kg/m2) were randomly assigned to ingest 21 g of leucine-enriched whey protein with carbohydrate (9 g) and fat (3 g) (Pro-En), an isonitrogenous amount of 21 g of leucine-enriched whey protein without carbohydrate and fat (Pro), or an isocaloric mixture (628 kJ) containing carbohydrate and fat only (En). Stable isotope tracer methodology was applied to assess basal as well as postprandial muscle protein synthesis rates in the three groups. RESULTS: Ingestion of protein in the Pro-En and Pro groups significantly increased muscle protein synthesis rates when compared with basal rates (from 0.032±0.003 to 0.053±0.004 and 0.040±0.003 to 0.049±0.003 %/h, respectively; P<0.05), whereas ingestion of carbohydrate and fat did not increase muscle protein synthesis rates in the En group (from 0.039±0.004 to 0.040±0.003 %/h; P=0.60). Despite the greater postprandial rise in circulating insulin concentration in the Pro-En group, no significant differences were observed in postprandial muscle protein synthesis rates between the Pro-En and Pro groups (P=0.32). Postprandial muscle protein synthesis rates were higher in the Pro-En vs En group (P=0.01). CONCLUSION: The ingestion of a nutritional supplement containing 21 g of leucine-enriched whey protein significantly raises muscle protein synthesis rates in non-sarcopenic older men, but co-ingestion of carbohydrate and fat does not modulate the postprandial muscle protein synthetic response to protein ingestion in older men. Br J Nutr. 2015 Sep 10:1-9. Protein supplementation in combination with resistance training may increase muscle mass and muscle strength in elderly subjects. The objective of this study was to assess the influence of post-exercise protein supplementation with collagen peptides v. placebo on muscle mass and muscle function following resistance training in elderly subjects with sarcopenia. A total of fifty-three male subjects (72·2 (sd 4·68) years) with sarcopenia (class I or II) completed this randomised double-blind placebo-controlled study. All the participants underwent a 12-week guided resistance training programme (three sessions per week) and were supplemented with either collagen peptides (treatment group (TG)) (15 g/d) or silica as placebo (placebo group (PG)). Fat-free mass (FFM), fat mass (FM) and bone mass (BM) were measured before and after the intervention using dual-energy X-ray absorptiometry. Isokinetic quadriceps strength (IQS) of the right leg was determined and sensory motor control (SMC) was investigated by a standardised one-leg stabilisation test. Following the training programme, all the subjects showed significantly higher (P<0·01) levels for FFM, BM, IQS and SMC with significantly lower (P<0·01) levels for FM. The effect was significantly more pronounced in subjects receiving collagen peptides: FFM (TG +4·2 (sd 2·31) kg/PG +2·9 (sd 1·84) kg; P<0·05); IQS (TG +16·5 (sd 12·9) Nm/PG +7·3 (sd 13·2) Nm; P<0·05); and FM (TG -5·4 (sd 3·17) kg/PG -3·5 (sd 2·16) kg; P<0·05). Our data demonstrate that compared with placebo, collagen peptide supplementation in combination with resistance training further improved body composition by increasing FFM, muscle strength and the loss in FM. Nutr Hosp. 2015 Jul 1;32(n01):202-207. EFFECT ON QUALITY OF LIFE AND HANDGRIP STRENGTH BY DYNAMOMETRY OF AN ENTERAL SPECIFIC SUPLEMENTS WITH BETA-HYDROXY-BETA-METHYLBUTYRATE AND VITAMIN D IN ELDERLY PATIENTS. AIM: The aim of our study was to investigate the effect on strenght and quality of life of an enhanced specific enteral formula with HMBD and vitamin D in elderly patients. METHODS: We conducted an open-label study. General assessment of nutritional status included measurements of body weight, height, body mass index (kg/m2) and bioimpedance. Handgrrip strength was measured by dynamometry. QOL (quality of life) was assessed using the well validated SF 36 questonnaire. Albumin, prealbumin, transferrin and 25-OH vitamin D were measured. All these parameters were recorded at basal time and after 12 weeks of nutritional intervention. RESULTS: Patients were divided in two groups by the median percentage of weight improvement (3.4%); group 1 (percentage of weight improvement < 3.4%) and group 2 (percentage of weight improvement > 3.4%). In group 1, patients showed an improvement in prealbumin and vitamin D levels. In group 2, patients showed an improvement of BMI, weight, fat mass, fat free mass, prealbumin, vitamin D levels, role physical domain of SF 36 , general health domain of SF 36 and handgrip strength. The volumetric consumption rates of the formula were higher in group 2 than group 1 (group 1: 1.25 + 0.78 units/day [1.81 +/-0.9 g per day of HMBD) vs. group 2: 1.86 + 0.82 units/day (2.79 +/-1.1 g per day of HMBD]). CONCLUSIONS: Elderly patients with a previous weight loss and with a high consumption of a HMBD and vit D enhanced formula had a significant improvement in anthropometric, biochemical parameters, handgrip strength and quality of life. Clin Nutr. 2016 Apr 7. BACKGROUND: It has been hypothesized that for older adults evenly distributing consumption of protein at 30-40 g per meal throughout the day may result in more favorable retention of lean mass and muscular strength. Such a thesis has not, to our knowledge, been tested outside of short-term studies or acute measures of muscle protein synthesis. AIMS: To examine whether the number of times an individual consumed a minimum of 30 g of protein at a meal is associated with leg lean mass and knee extensor strength. METHODS: Data from the 1999-2002 NHANES were used, with 1081 adults (50-85 y) constituting the analytic sample. A “multiple pass” 24-h dietary interview format was used to collect detailed information about the participants’ dietary intake. Knee extensor strength was assessed objectively using the Kin Com MP dynamometer. Leg lean mass was estimated from whole-body dual-energy X-ray absorptiometry (DXA) scans. RESULTS: Participants with 1 vs. 0 (βadjusted = 23.6, p = 0.002) and 2 vs. 0 (βadjusted = 51.1, p = 0.001) meals of ≥30 g protein/meal had greater strength and leg lean mass (1 vs. 0, βadjusted = 1160, p < 0.05 and 2 vs. 0, βadjusted = 2389, p < 0.05). The association of protein frequency with leg lean mass and strength plateaued at ∼45 g protein/meal for those consuming 2 vs. 0 meals above the evaluated protein/meal threshold. However, for those with only 1 meal at or above the evaluated threshold, the response plateaued at 30 g/meal. Leg lean mass mediated the relationship between protein frequency and strength, with the proportion of the total effect mediated being 64%. CONCLUSIONS: We found that more frequent consumption of meals containing between 30 and 45 g protein/meal produced the greatest association with leg lean mass and strength. Thus, the consumption of 1-2 daily meals with protein content from 30 to 45 g may be an important strategy for increasing and/or maintaining lean body mass and muscle strength with aging. Zinc and Taste Disturbances in Older Adults: A Review of the Literature. According to the National Health and Nutrition Examination Survey III, 35% to 45% of adults 60 years of age or older had zinc intakes below the estimated average requirement of 6.8 mg/day for elderly females and 9.4 mg/day for elderly males. Zinc deficiency may lead to loss of appetite, impaired immune function, weight loss, delayed healing of wounds, eye and skin lesions, and smell and taste disturbances. Older adults are especially affected by changes in taste sensations because of age-related gustatory dysfunction, use of multiple medications, increased frailty, and zinc deficiency. This article reviews the finding of clinical studies investigating the use of zinc supplementation for improvement with taste disturbances in older adults. Clin Nutr. 2016 Apr 30. Enriching a protein drink with leucine augments muscle protein synthesis after resistance exercise in young and older men. Maximizing anabolic responses to feeding and exercise is crucial for muscle maintenance and adaptation to exercise training. We hypothesized that enriching a protein drink with leucine would improve anabolic responses to resistance exercise (RE: 6 × 8 knee-extension repetitions at 75% of 1-RM) in both young and older adults. Groups (n = 9) of young (24 ± 6 y, BMI 23 ± 2 kg m-2) and older men (70 ± 5 y, BMI 25 ± 2 kg m-2) were randomized to either: (i) RE followed by Slim-Fast Optima (SFO 10 g PRO; 24 g CHO) with 4.2 g of leucine (LEU) or, (ii) RE + SFO with 4.2 g of alanine (ALA; isonitrogenous control). Muscle biopsies were taken before, immediately after, and 1, 2 and 4 h after RE and feeding. Muscle protein synthesis (MPS) was measured by incorporation of [1, 2-13C2] leucine into myofibrillar proteins and the phosphorylation of p70S6K1 by immunoblotting. In young men, both area under the curve (AUC; FSR 0-4 h P < 0.05) and peak FSR (0.11 vs. 0.08%.h.-1; P < 0.05) were greater in the SFO + LEU than in the SFO + ALA group, after RE. Similarly, in older men, AUC analysis revealed that post-exercise anabolic responses were greater in the SFO + LEU than SFO + ALA group, after RE (AUC; FSR 0-4 h P < 0.05). Irrespective of age, increases in p70S6K1 phosphorylation were evident in response to both SFO + LEU and SFO + ALA, although greater with leucine supplementation than alanine (fold-change 2.2 vs. 3.2; P < 0.05), specifically in the older men. We conclude that addition of Leucine to a sub-maximal PRO bolus improves anabolic responses to RE in young and older men. J Sci Food Agric. 2016 Sep 19. The Effects of Licorice Flavonoid Oil on Increasing Muscle Mass: A Randomized, Double-Blind, Placebo-Controlled Trial. BACKGROUND: The current study evaluated the effects of licorice flavonoid oil (LFO) on increasing the muscle mass of elderly populations using a randomized, double-blind, placebo-controlled study. Fifty participants aged 54-90 (male 7, female 43), who underwent rehabilitation treatment for osteoarthritis of the knee, were examined and assigned to either the LFO group (n = 26) or the placebo group (n = 24). The LFO group consumed 300 mg of LFO per day, while the placebo group consumed one placebo capsule per day for 16 weeks. We measured muscle mass, body fat percentage, and the score of the Japanese Knee Osteoarthritis Measure (JKOM) at baseline and every 4 weeks thereafter. RESULTS: In the LFO group, muscle mass in the body trunk increased significantly after 16 weeks of LFO intake (+0.38 kg, P = 0.02). The trunk muscle mass weight of the LFO group increased significantly compared with that of the placebo group (p < 0.01). Further, the body fat percentage and body trunk fat percentage of the LFO group were significantly suppressed compared to that of the placebo group (P = 0.03, P < 0.01, respectively). CONCLUSIONS: This trial indicates that LFO supplementation has effects on increasing muscle mass and on suppressing the body fat percentage of elderly populations, especially in the body trunk. BACKGROUND: The aim of this study is an evaluation of the effects of Pycnogenol® supplementation in a registry study in healthy aged subjects with sarcopenia, not using drugs and without any other clinical condition and risk condition. METHODS: The registry study included 64 healthy aged subjects (age range 70-78) with symptoms of fatigue. Two resulting groups included a control group (using an exercise plan and lifestyle changes) and a second group using the same plan and Pycnogenol® (150 mg/day). RESULTS: At start the groups were comparable. Subjects with loss of strength and apparent loss of muscular mass were included; no clinical disease was present; no other treatment was used. Significant improvements (P<0.0.5) in hand grip, weight lifts, walking distance without pain, number of stairs, in the time for feeling tired were observed in both groups due to the training. The supplementation group showed a more significant progress (P<0.05) in comparison with controls at 2 months. Proteinuria and general fitness were significantly better than values in controls at 2 months (P<0.05) with the supplementation. In the supplementation group a significant decrease in plasma oxidative stress was observed (P<0.05) in comparison with controls. Subjects using the supplement also improved their Karnofsky score (P<0.05) more than controls (who showed a minimal variation). The left ventricular ejection fraction (ultrasound) also had a significant improvement from 53.2±1.2% to 55.4±1.1% (P<0.05) with the supplement; this observations was superior (P<0.05) to the values observed in controls. Ejection fraction could be a very important parameter to evaluate, in a specific study, in more affected patients with more significant muscle loss and cardiac deterioration. There were no changes at 8 weeks in blood tests and physiological parameters. CONCLUSIONS: Supplementation with Pycnogenol® improved muscular strength and the general fitness level (also decreasing oxidative stress) in otherwise healthy, older subjects with symptoms of fatigue and signs of muscle mass loss. Am J Clin Nutr. 2016 Dec;104(6):1594-1606. Leucine supplementation enhances integrative myofibrillar protein synthesis in free-living older men consuming lower- and higher-protein diets: a parallel-group crossover study. BACKGROUND: Leucine co-ingestion with lower-protein (LP)-containing meals may overcome the blunted muscle protein synthetic response to food intake in the elderly but may be effective only in individuals who consume LP diets. OBJECTIVE: We examined the impact of leucine co-ingestion with mixed macronutrient meals on integrated 3-d rates of myofibrillar protein synthesis (MyoPS) in free-living older men who consumed higher protein (HP) (1.2 g · kg-1 · d-1) or LP (0.8 g · kg-1 · d-1) in rested and resistance exercise (REX) conditions. DESIGN: In a crossover design, 20 healthy older men [aged 65-85 y] were randomly assigned to receive LP or HP diets while ingesting a placebo (days 0-2) and Leu supplement (5 g leucine/meal; days 3-5) with their 3 main daily meals. A bout of unilateral REX was performed during the placebo and Leu treatments. Ingested 2H2O and skeletal muscle biopsies were used to measure the 3-d integrated rate of MyoPS during the placebo and Leu treatments in the rested and REX legs. RESULTS: Leucinemia was higher with Leu treatment than with placebo treatment (P < 0.001). MyoPS was similar in LP and HP during both treatments (P = 0.39) but was higher with Leu treatment than with placebo treatment in the rested (pooled mean ± SD: Leu, 1.57% ± 0.11%/d; placebo, 1.48% ± 0.08%/d; main effect of treatment: P < 0.001) and REX (pooled mean: Leu, 1.87% ± 0.09%/d; placebo, 1.71 ± 0.10%/d; main effect of treatment: P < 0.001) legs. CONCLUSIONS: Leu co-ingestion with daily meals enhances integrated MyoPS in free-living older men in rested and REX conditions and is equally effective in older men who consume daily protein intakes greater than or equal to the RDA. J Strength Cond Res. 2016 Oct 27.
β-hydroxy β-methylbutyrate (HMB) supplementation effects on body mass and performance in elite male rugby union players. Pre-season is characterized by high training volumes with short recovery periods β-hydroxy β-methylbutyrate (HMB) has been postulated to assist with recovery. HMB has been shown to improve strength and body composition amongst untrained groups the benefits of HMB amongst trained populations are unclear due to the methodologies employed. This randomized control trail determined the effects of 11 weeks HMB supplementation on body mass and performance measures in 27 elite rugby players. HMB group (n=13) mean±SD age 20.3±1.2 years, body mass 99.6±9.1 kg; placebo group (n=14), age 21.9±2.8 years body mass 99.4±13.9 kg for placebo. During the supplementation period body mass increased with HMB 0.57±2.60 kg but decreased with placebo 1.39±2.02 kg (p=0.029). There were no significant differences in any of the four strength variables (p>0.05). However, on the YoYo IR-1 the placebo group improved 4.0±2.8 levels but HMB decreased 2.0±3.0 levels (p=0.003). The results of this study suggest HMB could be beneficial for gaining or maintaining body mass during periods of increased training load. However, it appears that HMB may be detrimental to intermittent running ability in this group, although further research is required before firm conclusions can be made. Only 6 participants on HMB managed to complete both YoYo IR-1 tests due to injury, a larger sample size is required to fully investigate this potentially negative effect. Further, the mechanisms behind this decrement in performance cannot be fully explained and requires further biochemical and psychological investigation. J Appl Physiol (1985). 2017 Apr 13:jap.01116.2016. The Combined Effect of Bacillus Coagulans GBI-30, 6086 and HMB Supplementation on Muscle Integrity and Cytokine Response during Intense Military Training. The purpose of this study was to compare the co-administration of the probiotic Bacillus coagulans GBI-30, 6086 (BC30) with β-hydroxy-β-methylbutyrate (HMB) calcium (CaHMB) to CaHMB alone on the inflammatory response and muscle integrity during 40-days of intense military training. Soldiers were randomly assigned to one of two groups: CaHMB with BC30 (CaHMBBC30; n=9) or CaHMB with placebo (CaHMBPL, n=9). A third group of participants served as a control (CTL; n=8). During the first 28 days soldiers were garrisoned on base and participated in the same training tasks. During the final 2 weeks soldiers navigated 25-30 km per night in difficult terrain carrying ~35 kg of equipment. All assessments (blood draws and diffusion tensor imaging to assess muscle integrity) were conducted prior to and approximately 12 hours following final supplement consumption. Analysis of covariance was used to analyze all blood and muscle measures. Significant attenuations were noted in IL-1β, IL-2, IL-6, CX3CL1, and TNF-α for both CaHMBBC30 and CaHMBPL compared to CTL. Plasma IL-10 concentrations were significantly attenuated for CaHMBBC30 compared to CTL only. A significant decrease in apparent diffusion coefficients was also observed for CaHMBBC30 compared to CaHMBPL. Results provide further evidence that HMB supplementation may attenuate the inflammatory response to intense training, and that the combination of the probiotic BC30 with CaHMB may be more beneficial than CaHMB alone in maintaining muscle integrity during intense military training. Effectiveness of nutritional supplementation on sarcopenia and recovery in hip fracture patients. A multi-centre randomized trial. BACKGROUND AND OBJECTIVES: Functional deterioration and reduced mobility in elderly patients with a hip fracture are associated with a loss of both muscle mass and function (sarcopenia). The aim of this study was to assess whether oral nutritional supplementation (ONS) improves muscle mass and nutritional markers (BMI, proteins) in elderly patients with hip fracture. METHODS: Patients aged 65 years and over with hip fractures admitted to either of two rehabilitation facilities were included. Patients with diabetes, with Barthel index scores <40 prior to the fracture or with pathological fractures were excluded. A random-numbers generator was used to randomly allocate patients to the intervention group (IG) or the control group (CG). Those in the IG received a standard diet plus ONS in the form of two bottles a day of β-hydroxy-β-methylbutyrate (HMB), while those in the CG received a standard diet only. The intervention was not blinded. In order to assess changes in body mass index (BMI), anthropometric parameters were recorded at both admission and discharge. Patients’ functional situation was evaluated using the Barthel index (BI) and the Functional Ambulation Categories (FAC) score. Muscle mass was assessed using bioelectrical impedance analysis, which allowed us to calculate appendicular lean mass (aLM). The outcome variable was the difference between aLM upon discharge, minus aLM upon admission (Δ-aLM). RESULTS: Of the 107 randomised patients (IG n55, CG n52), 49 finished the study in the IG and 43 in the CG. BMI and aLM were stable in IG patients, whilst these parametres decreased in the CG. A significant difference was observed between the two groups (p<0.001, and p=0.020 respectively). The predictive factors for Δ-aLM were ONS (p=0.006), FAC prior to fracture (p<0.001) and BI prior to fracture (p=0.007). The concentration of proteins (p=0.007) and vitamin D (p.001) had increased more in the IG than in the CG. CONCLUSION: A diet enriched in HMB improves muscle mass, prevents the onset of sarcopenia and is associated with functional improvement in elderly patients with hip fractures. Orally administered nutritional supplements can help to prevent the onset of sarcopenic obesity. Clin Nutr. 2017 Oct 6. Impact of the calcium form of β-hydroxy-β-methylbutyrate upon human skeletal muscle protein metabolism. BACKGROUND & AIMS: β-hydroxy-β-methylbutyrate (HMB) is purported as a key nutritional supplement for the preservation of muscle mass in health, disease and as an ergogenic aid in exercise. Of the two available forms of HMB (calcium (Ca-HMB) salt or free acid (FA-HMB)) – differences in plasma bioavailability have been reported. We previously reported that ∼3 g oral FA-HMB increased muscle protein synthesis (MPS) and reduced muscle protein breakdown (MPB). The objective of the present study was to quantify muscle protein metabolism responses to oral Ca-HMB. METHODS: Eight healthy young males received a primed constant infusion of 1,2 13C2 leucine and 2H5 phenylalanine to assess MPS (by tracer incorporation in myofibrils) and MPB (via arterio-venous (A-V) dilution) at baseline and following provision of ∼3 g of Ca-HMB; muscle anabolic (MPS) and catabolic (MPB) signalling was assessed via immunoblotting. RESULTS: Ca-HMB led a significant and rapid (<60 min) peak in plasma HMB concentrations (483.6 ± 14.2 μM, p < 0.0001). This rise in plasma HMB was accompanied by increases in MPS (PA: 0.046 ± 0.004%/h, CaHMB: 0.072 ± 0.004%/h, p < 0001) and suppressions in MPB (PA: 7.6 ± 1.2 μmol Phe per leg min-1, Ca-HMB: 5.2 ± 0.8 μmol Phe per leg min-1, p < 0.01). 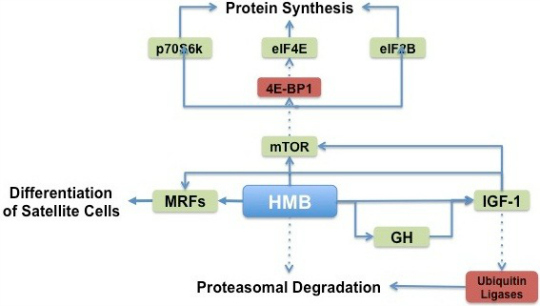 Increases in the phosphorylation of mTORc1 substrates i.e. p70S6K1 and RPS6 were also observed, with no changes detected in the MPB targets measured. CONCLUSIONS: These findings support the pro-anabolic properties of HMB via mTORc1, and show that despite proposed differences in bioavailability, Ca-HMB provides a comparable stimulation to MPS and suppression of MPB, to FA-HMB, further supporting its use as a pharmaconutrient in the modulation of muscle mass.